Listening to the mainstream media and the dominant party in D.C. this week would lead one to believe that the earth would quit revolving on its axis, the sun would no longer rise, and all life forms would cease to exist if the government was shutdown. But low and behold, life continues, and one can’t help but feel just a little more free, although even that is undoubtedly illusory. While opinions may vary regarding who gets the credit for curtailing spending by shutting down non-essential federal government functions for a few days or weeks, most of the credit must be ascribed to the president and the Senate Majority Leader, Harry Reid. After all, they were the ones who decided that the spending bills passed by the House were not to be even considered in the Senate; all twelve of them, to date. Should say, "Has he no shame." Harry Reid actually had the audacity to say of the House, “Who are they that they can pick and choose what programs to fund or not to fund?” As is the case with most who belong to his political party, the good senator should acquaint himself with the U.S. Constitution, which specifically states that all spending bills originate in the House. As such, the House has every right to decide what to fund and what not to, and is fulfilling its constitutional duty in the process. If Reid had any integrity or backbone whatsoever, he’d take up a version of one of the House’s resolutions and at least bring it to the floor for a vote. Since he refuses to do so, the credit for extending the quasi-shutdown is all his and the president’s, as they refuse to even consider anything that varies from their desires. What’s most perplexing about the positions of the House and the Senate is in how the priorities of one party are somehow less important, hence negotiable, while the other’s is not. The president and the Senate are obdurate in their resolve to not accept anything but a complete funding of government. The House has some divisions even within the Speaker’s party over funding Obamacare. Yet the media and the liberal punditry seem to think that the only ones who should capitulate are those in the House. Granting the benefit of the doubt to both parties that their positions are based in principle, why is one principle deemed negotiable while the other’s is not? If the funding and operation of Obamacare is so critical to governmental operations, according to the governing party, why has the president by fiat simply changed certain implementation dates and requirements? The fact that he’s granted over 1,000 waivers, mostly to unions and political allies, and by the stroke of his pen delayed the employer mandate by a year, clearly evidences that the health care law is not inviolable. Yet he and Reid will not even consider a spending bill that includes a one-year delay in the individual mandate. 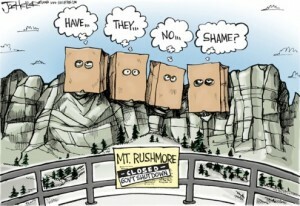 It appears that a delay in implementation is only a good idea to Obama if it’s his idea or it benefits his benefactors. Reviewing the list of what constitutes “essential” versus “non-essential” federal workers makes one realize this is not really a government “shutdown,” it’s more of a slow-down or a slim-down. There are a total of about 2.7 million federal government employees, including 589,000 postal workers. According to reports, there are 800,000 “non-essential” employees who’re on furlough until full funding is restored. That means 63% of the federal work force is still working, including almost all of the Social Security Administration, Homeland Security, and our military and most of the defense department. Even Health and Human Services is nearly fully staffed. With the modus operandi motto of “Never let a good crisis go to waste,” the administration is acting the same way they did when their sequester went into effect. They want to make sure everyone feels the pain and discomfort of the slim-down. Not being content to close the national parks, the administration ordered barricades, (or should we call them Barry-cades?) and closed signs posted for parks that aren’t even staffed. 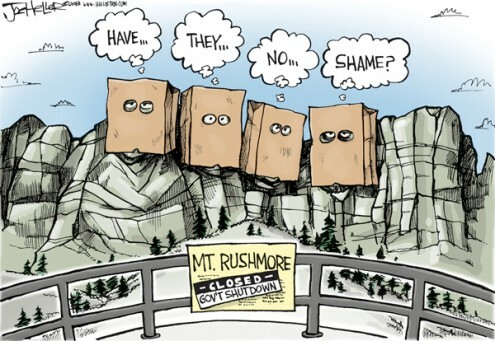 They even attempted to close national landmarks that are not funded by the government, including Mt. Vernon, the Claude Moore Memorial Farm, and over 100 campgrounds near the Grand Canyon, which are all funded privately. It would appear that the president’s desire is to make the slim-down more painful to the average citizen than needs be, if for no other reason than to make sure everyone notices, is inconvenienced, or is perturbed. After all, what kind of a “good crisis” would this be if the government “closed down” and no one noticed? AP award winning columnist Richard Larsen is President of Larsen Financial, a brokerage and financial planning firm in Pocatello, Idaho and is a graduate of Idaho State University with degrees in Political Science and History and coursework completed toward a Master’s in Public Administration. He can be reached at rlarsenen@cableone.net. Love the details. thanks for sharing. Thank you so much for this. I’m in a period of waiting, unsure how God will help resolve can difficult situation and where He wants me to go from here. I believe part of the process is leaning how to wait… to listen. Thank you for the encouragement!